Nick grew up In Carbondale, PA where he started playing baseball at the age of 3. At age 9, Nick began playing baseball year round, training with former pro players. He was a 4-year varsity baseball & basketball starter at Carbondale Area High School, where he also lettered in golf. His sophomore year he was voted 2nd team all Lackawanna League SS, while leading the league with a .525 batting avg. His junior year he was voted 1st team, while hitting .420. He finished his high school top 5-all time in every hitting category. Mazza chose to play college baseball at Div II Bloomsburg University. His first two seasons, he started at six different positions. He batted .333 his junior year & .314 his senior year serving as an everyday outfielder. Nick finished his college career with a .316 batting average. Nick graduated and moved to NY. The most rewarding experience for Nick was instructing children from the NY City Autism School in the game of baseball. He has learned that through patience & hard work that baseball is a game in which all children can succeed. 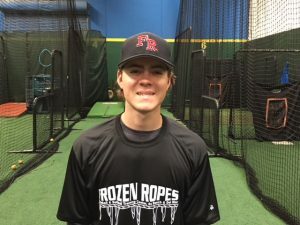 He looks forward to bringing his passion for the game to Frozen Ropes. Ryan is an outstanding athlete and leader who was the starting 3rd baseman for the 2004 CIF Sac-Joaquin Section Champion Davis High School Blue Devils. He then spent 2 years at the California Ranked Cosumnes River College before completing his college career at Whittier College where he was a 1st team All-SCIAC selection as an infielder and graduated with Honors and a B.S. in Child Development in 2008. He was also a member of the 3-time defending SDABL Champion Bones from 2008-2010. 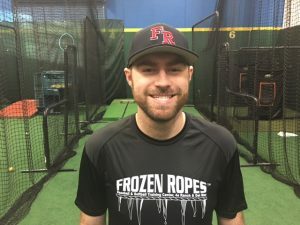 Ryan has provided instruction in all aspects of the game, is an expert at video analysis of both hitters and pitchers, and plays an integral role with Frozen Ropes. A former 10 year professional player with the Indians, Pirates, Padres, Rangers, and Mets organizations where he was a 4 time Minor League All-star, Tracy was a hitting coach in the Pittsburg Pirates organization at the end of his playing career. Later, while spending 8 years as a youth baseball coach at Baseball USA in Houston, TX, he coached nationally renowned 18U, 16U, and 15U select travel teams for the Houston Heat. 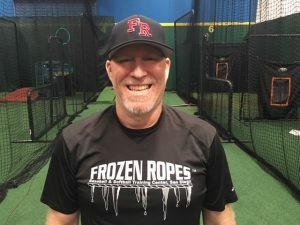 A great communicator of the game to players at all levels, his wealth of experience and knowledge as both a player and a coach make him a valuable asset to our Frozen Ropes’ students. We are lucky to have him on our staff and he is excited to be bringing his coaching talents to San Diego. Bobby grew up in San Diego where he played in Rancho Bernardo Little League and travel baseball all over Southern California. Brown graduated from Rancho Bernardo High School in 2007 where he played under coach Sam Blalock. He earned first-team All-Palomar League honors his junior season and second-team honors his senior year. Brown played college baseball at the University of Arizona under head coach Andy Lopez. During his senior year he hit a career high .348 with 59 RBI’s leading his team to its first PAC- 12 Championship in 20 years. That year he was honored on the First Team All-PAC-12 and won the 2012 College World Series in Omaha!! After his senior year he signed professionally with the Kansas City Royals where he plays First Base and Outfield. 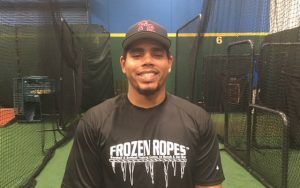 Bobby looks forward to bringing his years of baseball knowledge to Frozen Ropes, he is a welcome addition to our staff. Kerrie grew up in Randolph, Ohio and started playing coach-pitch when she was 4. She started her pitching career at the age of 5. Growing up playing fast pitch, once she reached the age of 12 she moved into the world of travel softball. She played travel softball until she continued her career into college. She went to Field High School in the Portage Trail Conference- Metro division. There she received Honorable Mention all district as a sophomore, 2nd Team as a junior, and was named Player of the Year her senior year and was part of the Division Championship winning team. Kerrie attended Wilmington College, Wilmington, Ohio. There she received Honorable Mention all OAC (Ohio Athletic Conference). 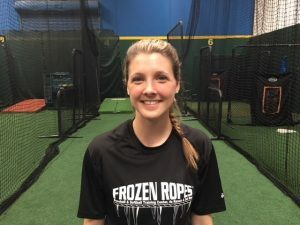 She has been giving softball lessons for going on 7 years and loves giving back to the game that made her who she is. Brandon was born and raised in St. Louis, MO. He started playing baseball at the young age of 2, and fell in love with the game. He attended Desmet Jesuit High School where he batted .498 in his Senior year. Gutzler attended St. Louis Community College. In 2 years, Brandon had a career batting average of .402 with 21 home runs and 119 RBIs. He was honored with 2nd Team National Junior College Athletic Association All-American & Region 16 Player of the Year. He was recruited to play Division 1 baseball at Murray State University In his 1st year, before a season ending ankle injury, he batted .385 with 5 home runs & 24 RBIs in the first 16 games of that season. In his red-shirt Junior season, Brandon batted .353 with 16 home runs and 71 RBIs. In that same season, Gutzler held the longest active on-base streak in all of college baseball, reaching base 44 straight games while missing the overall NCAA record by only 2 games. He also received three awards that season including National Collegiate Baseball Writers Association 2nd Team All-American, 1st Team All-OVC, and 2nd Team American Baseball Coaches Association/Rawlings South All-Region. He finished his Senior year batting .351 with 10 homeruns & 51 RBIs. He was an All-Ohio Valley Pre-season Team Selection, National Collegiate Baseball Writers Association Preseason 2nd Team All-American & 2nd Team All-OVC. 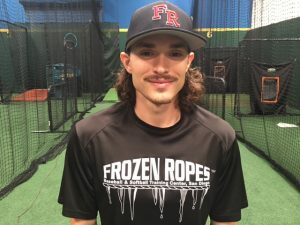 Brandon hopes to share his knowledge of and passion for the game of baseball with kids here at Frozen Ropes. Brian is a graduate of Santana High School in Santee. While at Santana he played baseball all four years. He was the Captain and MVP for his Freshman and Junior Varsity teams. During his Junior year he was awarded First Team All-Academic honors. In his Senior year Brian lead his team with a 1.76 ERA, 67 Innings Pitched, and 52 Strikeouts. He earned First Team All-League and First Team All-Academic honors. His team voted him Team MVP, CY Young Award, and Silver Slugger awards. After High School, Brian attended Grossmont College. He played two years under head coach Randy Abshire. Brian split time between being a starting pitcher and relieving. After two years at Grossmont, Brian received a scholarship to Bluefield College in Virginia. He turned down the offer to stay in San Diego and pursue his degree. Curt was a 3 sport athlete at Serra High in San Diego. Always a “team player” who would play any position to help his team win, he has been playing baseball for over 30 years and has participated in the local Adult Baseball League for over 15 years. His coaching experience includes youth leagues in Basketball and Baseball in San Diego all the way to the High School Level. He has worked for Nike, Sports Authority and other Baseball Training Facilities to hone his sports knowledge. Curt also owned Sports Cards Stores locally and still has over 100,000 baseball cards. You might even get a card for doing something good at Frozen Ropes (Hulky loves to give away cards). He currently resides in Carlsbad with his wife Donna. He has 5 children in total; Bobby 32, Katrina 30, Tawny 27, Brandie 22 and Jake 22. 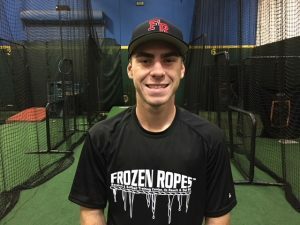 Curt has a great love for sports and kids and is looking to make Frozen Ropes his new home for a long time. 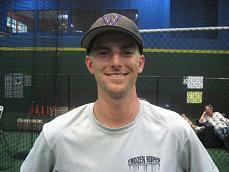 Jake comes to us from Del Norte High in 4S Ranch where he was a 2 Year Varsity Pitcher. His ERA as a Senior was 3.40 and he averaged more than a strikeout per inning. Opponents hit only .182 against Jake over 2 seasons. He also played 1st base for the Nighthawks. The Nighthawks were Valley League Champions in 2011 and had a combined record of 34-26 from 2011 to 2012. Jake was a 2 time Scholar Athlete while at Del Norte. His final game as a Pitcher in High School was a 17-2 win in which he struck out 6 batters in 4 innings, gave up 0 earned runs and 2 hits. Jake was also a member of the Del Norte Basketball team and scored 28 points in his last game as a senior. He is currently a Junior at Cal State San Marcos. 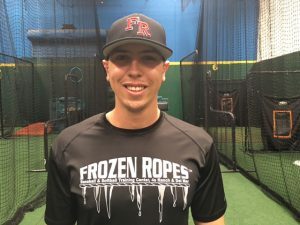 He looks forward to working with the kids at Frozen Ropes and teaching them the fundamentals he learned through his 13 years of organized baseball. Raised in St. Louis, Missouri, he played select travel baseball all over the Midwest. Case was a high school All-American for Francis Howell High School. Hitting above .450 his senior season, he was apart of the class 5A state championship team. From Howell, he then went to play outfield for the Missouri Tigers. As a freshman, Case was a part of the Big 12 Championship team. After his freshman season, the Tiger then moved to the SEC conference. Munson was the starting center fielder as they played against the best schools in the country. After playing all four seasons at Mizzou, he then graduated with a degree in Communications. In 2015 he was the head JV Softball coach for Francis Howell High School. In his first season coaching, he led the lady vikings to a 17-3 season. 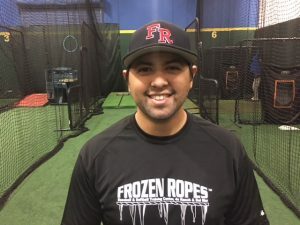 Pursuing his dream to live in California, he now is here at Frozen Ropes wanting to help teach and coach the athletes to enjoy the game of baseball/softball as much as he does. Jesse is a local Poway native, playing for Poway high school before going on to play at Grossmont College. Jesse was drafted out of Grossmont college in 2008 by the Arizona Diamondbacks where he played for 2 years and recorded a win in a no-hitter. After the Diamondbacks Jesse signed with the San Diego Padres as a free agent where he posted a 2.80 ERA as a reliever. 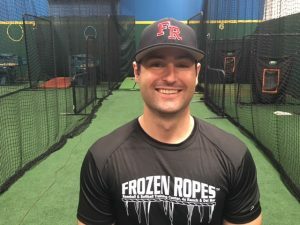 Jesse brings years of advanced training and mental preparation to the Frozen Ropes team. Marco grew up in Imperial Beach, but played his entire little league career in Mexico starting at 3 years old. As a kid he traveled all across the world from Mexico to Australia playing in regional and state tournaments as a part of the selected few who got the chance to represent Mexico. Leyva attended Mar Vista High school and was a Tri-sport athlete having played football, basketball and baseball, however, his focus always remained on baseball. He was also a part of the South Bay Clash travel baseball team. Leyva played all 4 high school years on the varsity baseball team at Mar Vista as the starting catcher. In 2013, he was on the San Diego Section players to watch list and was invited to play in the Junior Olympics. His senior year his batting average was .478 and led Mar Vista to a runner-up finish in the Division 4 CIF Championship Game and was invited to a Tampa Bay Rays scout tryout. He finished his career earning 1st team all south bay league 3 out of his 4 years. Marco earned a baseball scholarship following his senior year at Mar Vista to play baseball at California State University, East Bay. Unfortunately, he suffered a serious injury to his throwing shoulder right before his freshman year at East Bay, that did not allow him to play a game and ended his college career. 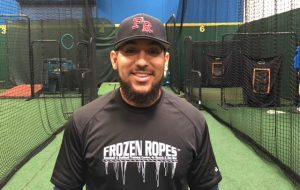 Leyva now looks forward to passing down the knowledge he gained throughout his playing career to the young athletes here at Frozen Ropes. Griffin started his baseball career playing in the local 4S Ranch little league, where he would continue to play until he started high school. He played high school ball at Del Norte. During his junior year he came out of the pen a total of 21 games and held hitters to a sub .200 batting average. He averaged over one strikeout per inning and became the total saves leader in Del Norte. During senior year he was moved to the starting rotation. He started his season with 19 straight innings without an earned run. During the course of the season he maintained a 2.4 ERA and averaged over one strikeout per inning as well. He left his career at Del Norte with the all time saves record, 3rd all time strikeouts, and 3rd all time in strikeouts per nine. Currently Griffin continuing his playing at Palomar college. He will be entering his second year of play at Palomar college in 2019. Griffin looks forward to passing down his knowledge to all players. A former Major Leaguer with the Oakland A’s and 2-time College World Series Champion at Stanford University as a player, Ron has 10 years of coaching experience at the collegiate level where he has served as a hitting coach at both Stanford and Cal. Ron has coached over 50 professional players and more than a dozen major leaguers including current up & comers Conor Jackson, Brennan Boesch, John Baker, and Allen Craig. 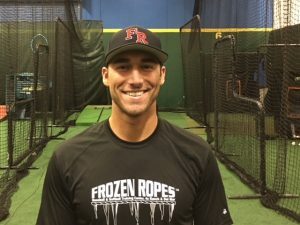 He is excited to bring the highest level of instruction and training to the San Diego Community through Frozen Ropes. 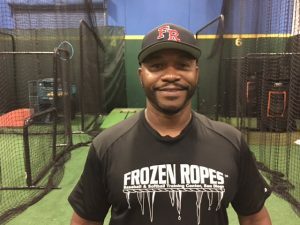 Joe brings many years of baseball and teaching experience to Frozen Ropes. A graduate of the University of Kansas, Joe had a professional pitching career with the Pittsburgh Pirates organization (1968-1971) that was cut short due to injury. He has been a successful coach for several years in North San Diego County at the travel ball and high school levels. Currently, he coaches 2 travel teams and is a highly respected pitching coach for one of San Diego’s top high school programs. An excellent communicator, Joe believes in not only building proper mechanics but also in developing the mental side of the game. His goal is to produce the complete pitcher and he understands what it takes to compete at the highest levels. His son, Brad, whom he continues to mentor, was a professional pitcher in the Colorado Rockies organization.